During this project in Woolwich, on a lot bordering the Kennebeck River, the client was on-site every day, which made it easy to communicate. It helped to make this project into exactly what they wanted. 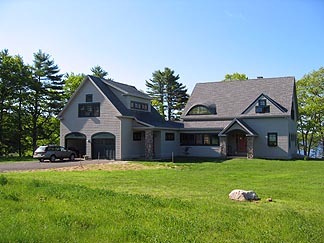 The siding is Hardi brand shingle plank, a cement product with a 50-year warranty. 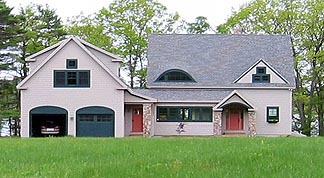 The trim color was custom blended to match green of the Marvin windows cladding, which finish off the exterior of this architect-designed dwelling. 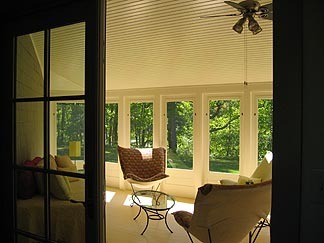 The sun porch, seen here at the rear of the house, has interchangable screens to storm panels in winter. The interior of the sun porch is warm. It overlooks a stream running into the river. 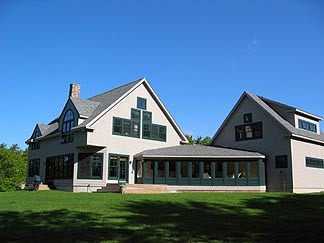 Structures such as this bring the outside in year-round--even in Maine. The entryway leads to laundry area with a farmers sink. The split Dutch door was custom crafted to keep the family dogs contained. A slate floor, and other "farmhouse" fixtures lend an air of country informality while remaining attractive. The living room is anchored by a custom fireplace. The hardwood floors are underlaid with radiant heat. 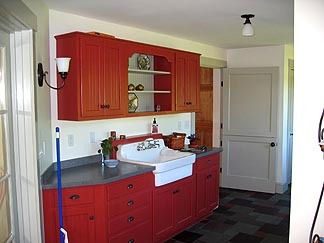 The quarter-sawn oak cabinets were built by same company as the kitchen cabinetry. 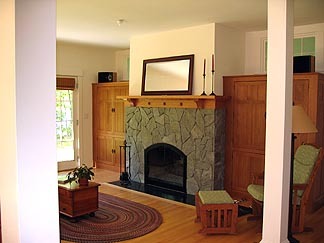 The mantel represents design collaboration between carpenter and home-owner. 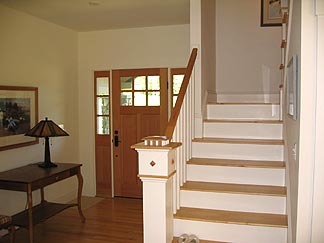 Here is the formal entrance with stairs. The client brought a picture of the newel post from a magazine. Our carpenter matched it, down to the lighted inside. The fir door has a natural finish and sidelights, making the entry bright and inviting. 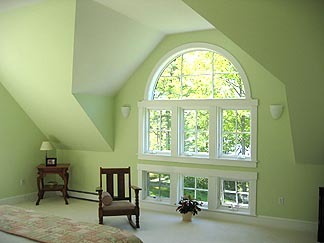 The master suite overlooks the river through stock windows combined in unique configuration to provide custom look. Twelve foot ceilings add to the spaciousness. 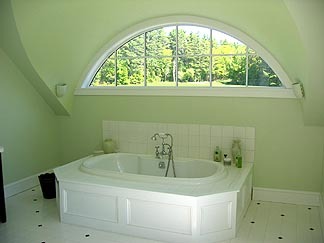 The master bath includes awhirlpool tub with Porchet fixtures. The surround is custom-built with a removable panel for maintenance. Tile protects the floor, tub-deck, and backsplash.